I don't know about you, but we have given our reusable bags quite a workout. We've had ours for about 6 years, the bags are still in great condition, but over time, a few of the little storage bags have gotten lost along the way. Without their baggies, carrying your reusable bags can get a little unwieldy. To get things back to their ordered state, I decided to make some new baggies, this time with fun patterns. I used cotton fabric, so the new baggies can be easily washed, and patterned, so that any stains would be camouflaged. The baggies have a sewn in tab that flips down to close, and keeps everything in their place! 1) Cut a piece of fabric that is 5 1/2" x 15." 2) Fold, pin and press the short edges 1/4" (both the top and bottom). 3) Fold, pin and press the short edges 1/4" again, so that the unfinished edge of the fabric will be hidden inside the fold. 4) Sew a 1/4" away from the edge. 5) Fold one of the finished edges 2" down (wrong side to wrong side), pin and press. 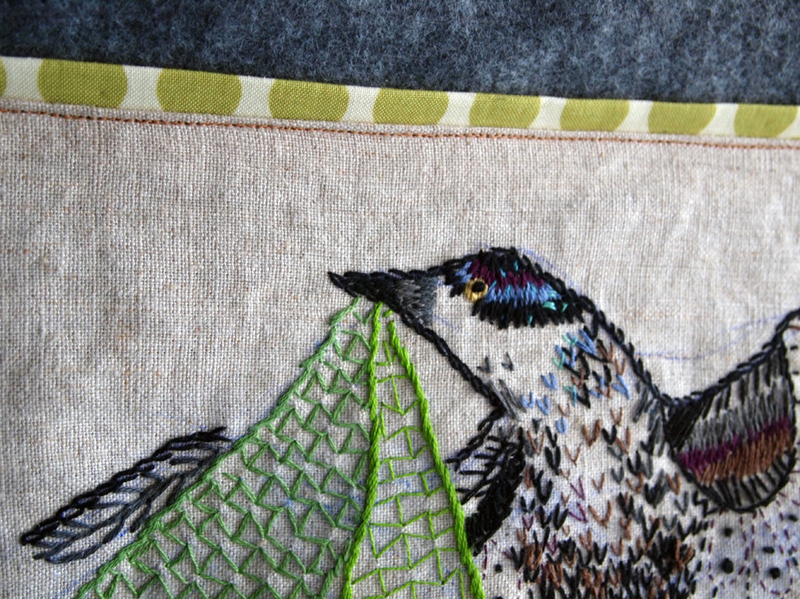 6) Sew across the folded piece, following along the line you stitched previously. This is creating the tab that flips down to close the top of your baggie. 7) Lay your fabric wrong side down, and fold your sewn tab back onto the main part of the bag. 8) Fold the other end up to meet the sewn edge of your tab. This action is sandwiching the tab, in between the front and back parts of the bag. 9) Pin, and press the unfinished, open edges. Sew up the sides. 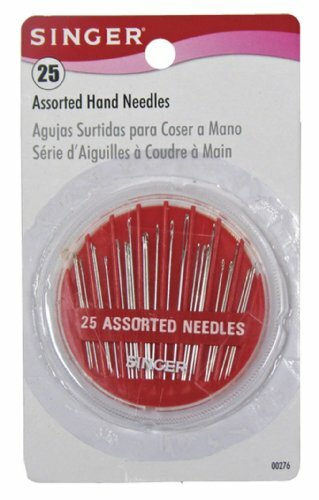 Trim your threads, and any excess fabric on your seam allowance. 10) Flip your bag right-side out, and get all of your reusable bags back into the rotation! One of my great friends from college just had a baby! Yay! She lives far away and I wanted to send her something special, since I can't descend upon her and give her and her baby in-person love. 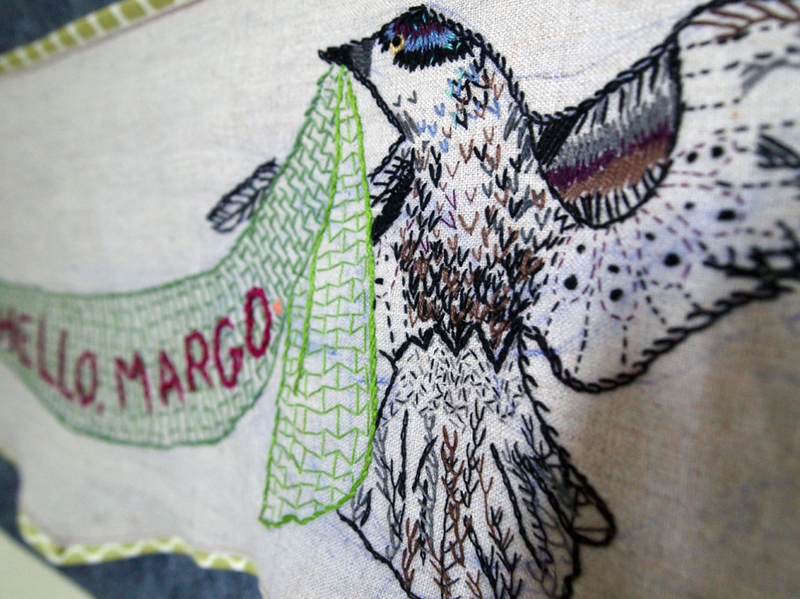 I decided to make a banner using blackbirds, an image that she uses in her own work, and also used my embroidery skills that have been closeted for far too long. It felt pretty good to get the box of embroidery floss out and flex my stitching muscles. I used a big variety of stitches on the banner and I'm going to show you how to do one of my favorites, the Japanese Darning stitch. 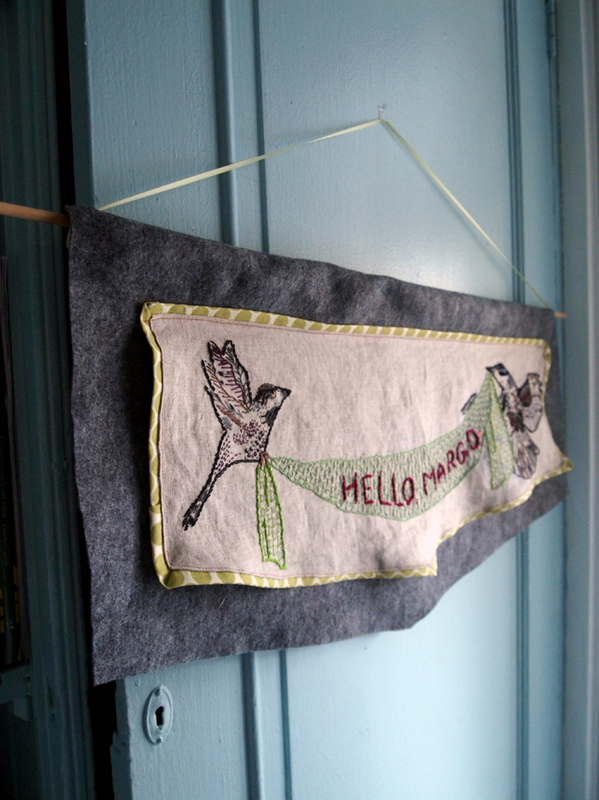 That's the stitch I used in that background of the sash that the birds are holding. The history of darning, repairing or reinforcing worn or damaged fabric, is widespread and was a normal practice before buying new clothes was as easy as buying groceries in the grocery store down the street. Different cultures took on different styles, one of the more decorative and better known styles is sashiko from Japan. I did some quick research to see what the history of this particular stitch is and couldn't find anything specific. Based on the generalized name, my best guess is that the "Japanese Darning Stitch" is a westernized simplification of those Sashiko techniques or a style related to them. History aside, I chose to share this stitch because of the texture it provides, and the neat detailed shapes, plus the infrequency of use; I don't see it very often. Like Maria Von Trapp says "Let's start at the very beginning," with the basic darning stitch. I used different colors to help differentiate rows and steps, hopefully easier for you to visualize. All of these pictures can be clicked on so you can get a closer look. Bring it through to the front. Use the needle to pick up a few threads, bring the needle across the fabric, now pick up a few more threads, and pull the thread all the way through; repeat until the end of your row. The difference between the darning stitch and the running stitch is the darning stitches are long with small smaller spaces in between and a running stitch has even stitches and spaces. The next row is going to be off center from the first, meaning the new stitch will be centered over the previous row's space, and this row's space is centered over the last row's stitch. Here is a picture with lines drawn over the stitches, showing you how the stitches and spaces are aligned. Again, you can click on this to make it bigger. Fill in your shape with the darning stitch. Pull the thread through at the right side of a stitch (purple row). In the row above (orange), insert the needle in one side of the space where the thread goes behind the fabric, bring the needle back to the front of the fabric at the same place as the row's stitch comes forward. Pictures are below each instruction. Bring the thread to the first row (purple), thread it through the space where the original row (purple) goes behind the fabric. Back to the orange row, follow the orange thread behind the fabric and back out again. Repeat these steps to the end of the row. Once you finish the row, bring the thread the left of an orange stitch, go the the next row (purple) and do the same steps in reverse. Follow the purple thread behind and then in front of the fabric. Now, back down to the orange row, bring the thread behind the fabric with the orange thread, and then back to the front. Now you'll start to see the hourglass shapes form. Continue across the row, proceed to the next row and finish filling in your shape. That is the basic structure for the Japanese Darning stitch. If your stitch ends at a funny spot on the edge, just fill in the missing spaces with single stitches. Here is the stitch completed over an area in the three color version, and then the single color for comparison. Do you think you can use this stitch in your own work? I love the look when you fill in large spaces with it. You can even use it as a base and then work on top. 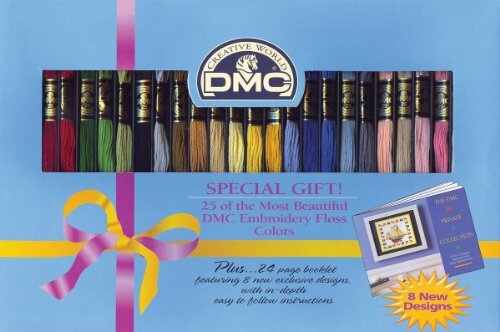 Now get stitchin'! I never had a treehouse growing up, but that didn't stop me from dreaming about what my ideal treehouse would include. I even had drawings that included my dream treehouse that doubles as a home for my dream pets, gibbons. Yes, I dreamed of sharing my treehouse with gibbons. I didn't take into account the cleaning up after monkeys part of this but that's what dreams are for. My treehouse fascination hasn't really subsided, I asked for Treehouses of the World for my 15th birthday. The author, Pete Nelson, has a TV show, Treehouse Masters and I love it! I maintain that I will get my treehouse one day but for now I came up with a substitute that can live amongst my indoor trees, my houseplants. You can make a mini treehouse for your houseplants and terrariums too! The first step is to download the template and cut out the pieces. Now, heat up your iron to the cotton setting and cut 4 strips of the veneer that are 1/2" longer than the main piece of the template. 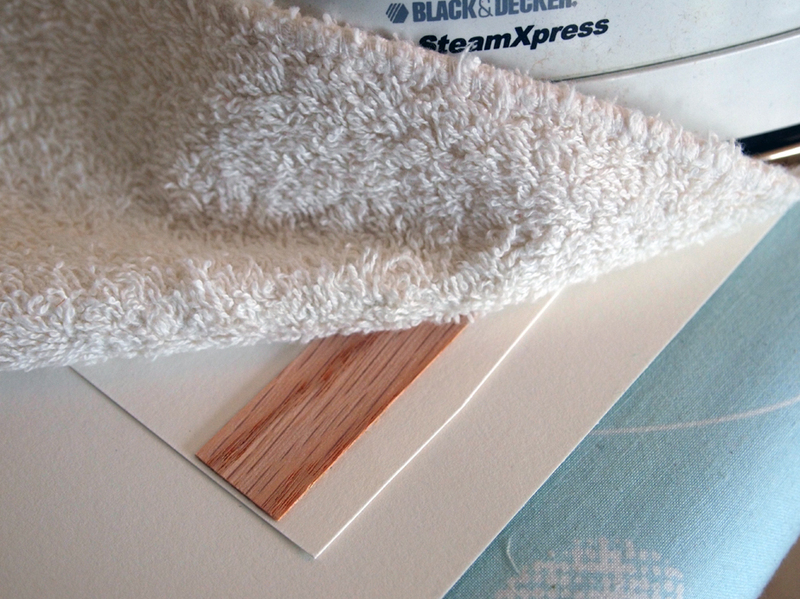 Lay the first piece of veneer on your cardstock, glue side down, cover with your press cloth (protects your iron from any extra glue) and apply heat from your iron until the veneer is stuck to the paper (15-30 seconds). Use a pen or a bone folder to run over the veneer to even out the glue and the seal. Add the next strip of veneer, slightly overlapped with the first piece, and apply heat from the iron (use your press cloth!). Repeat with the next two pieces. Make sure that this creates a surface that is big enough for your template to fit on and not extend beyond the edges of veneer. If it isn't big enough, just add another strip of veneer. 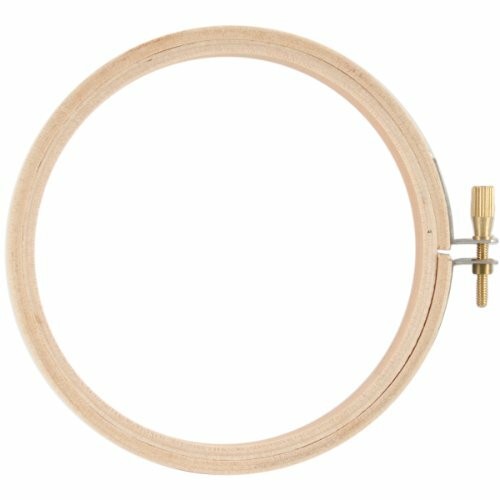 Use double stick tape, or tape loops to fasten your template to the veneer. The trick here is to go nice and slow. You're going to use your utility knife and ruler to cut around the edge of the template. Line the ruler up with the edge and use it as the guide for your knife. 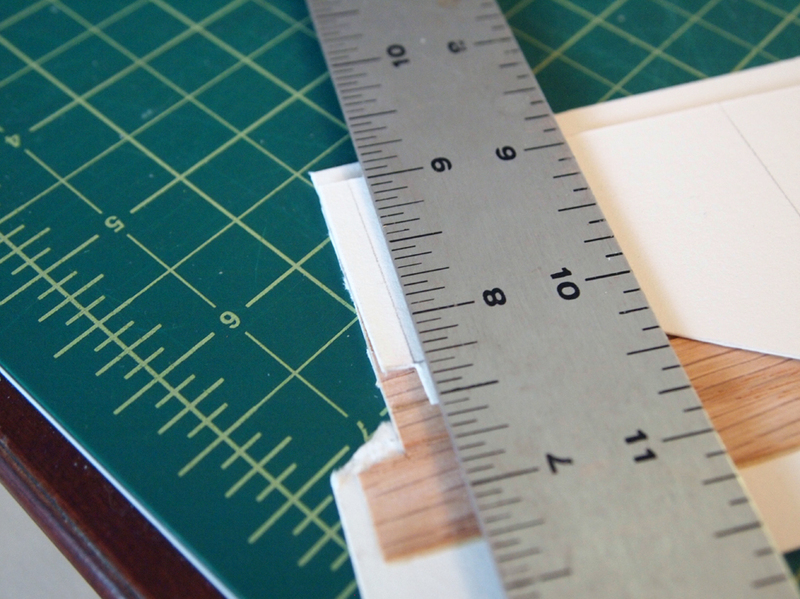 Some general safety guidelines: When you use the ruler as a guide, make sure the ruler is on the side with the most material, and you cut on the side with less area. This just gives you more material to hold onto and it's safer to cut. See the pictures below. Incorrect, with ruler only covering the sliver being cut off. Correct, with ruler on the side with most material and cutting off a small sliver. If you are left handed this is perfect, if you are right handed, rotate so your left hand holds the ruler and your right hand wields the knife. The second safety consideration is about using the utility knife. You are not going to cut this in one fell swoop. You have much more control if you cut it in many shallow cuts. Each edge could take 5-10 swipes to cut through the veneer and the paper. Just be patient, it's not worth slicing your finger to finish the project. If you start to get frustrated, just walk away for a few minutes and come back to it. After the shape is cut out you can score the fold lines using the same knife and ruler. Scoring is cutting through the top layers of material to make folding easier. You don't cut all the way through. For comparison, this stage will take about 2-3 swipes with the knife. Carefully fold along the score marks, apply glue to the wall tab and clamp closed for about 30 minutes. Wipe excess glue off of the edge while it's wet. I chose this glue because it's waterproof and will hold up to the moisture from plants, but it does dry white and it expands, so use it sparingly and wipe off excess while it is still wet. While the house is drying, cut four short strips for the roof and iron the veneer on the cardstock in the same layered fashion used for the main part of the house. After the drying time, add glue to the roof tabs and lay the roof on top of the house. I couldn't figure out a good way of clamping the roof to the top, so I went with the old school method of wrapping the house in twine to firmly hold the roof in place. Again, wipe excess glue while it is wet. While the roof is drying, you're going to iron the veneer for the porch. For this application, iron on the veneer side by side. It will look more like decking as opposed the siding of the house. To protect the backing paper from moisture and to add strength, on one side the veneer will lay up and down and on the back the veneer will lay left to right (perpendicular). This will prevent the deck from buckling when we attach the stick, or over time from moisture. Since the porch veneer is thinner, I used some junky scissors (so the veneer wouldn't dull sharp scissors) to cut the porch out. Use the glue and twine method to attach the house to the porch. Once the house is attached after the drying time, use acrylic paint to add details to your house. I added windows with green edging and used some gray paint to represent the reflections on glass. I added a pop of color with a red door and then used green and brown in splotches to add some moss on the roof. You could glue natural materials on to your house to add character, like moss or small twigs; I wanted to wait to see how the house ages in the plant environment before I add too much. Wait 24 hours to make sure that your house and all the glue has time to completely dry. Use your drill with a drill bit matching the size of your dowel. Drill the hole where it will be hidden by the house and the end of the dowel will be inside the hollow part of your house. Go slow and be careful not to drill through your roof or your hand for that matter. Next, add some glue to the edges of the drilled hole and fit the dowel rod into the hole. Leave it for a few hours for the glue to dry. Now add your house to a potted plant or terrarium! Make this project, add your own spin and share your results with us! We're on twitter and instagram! Follow us! Share your version of the Tiny Treehouse!